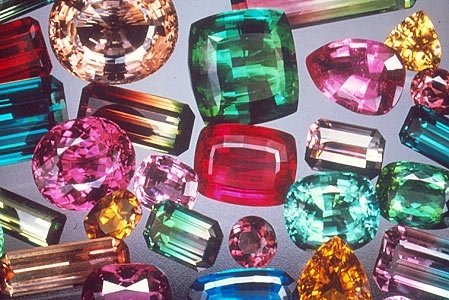 As a jewelry designer, tourmalines are one of my favorite gemstones because they are so versatile. You can get all sizes, shapes, faceted or cabbed. They come in a rainbow of colors and their hardness is such that they can be used in rings (meaning they can be worn on the hand, but I wouldn’t bang them around too much). Their color ranges from a beautiful turquoise blue to a spectrum of pinks, greens and yellows. You can even get bi-colored tourmalines which are often called watermelon tourmalines because they are both pink and green. But my favorite tourmalines are the paraibas mined in Brazil. They are the most beautiful color of turquoise. They are rare and their scarcity is reflected in the price but they are worth every penny. 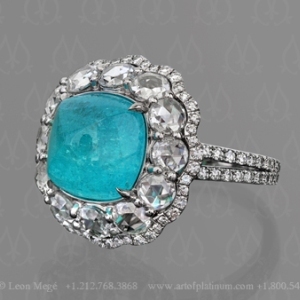 We have a beautiful sugarloaf cab paraiba at the shop, just waiting to be designed and set in your next ring! This entry was posted in Design Inspiration, Featured, Heartbreakingly Beautiful, Hip and High End, Mollie, Rocks that Rock and tagged custom, designer, gem stones, jewelry design, ring, Stones, tourmalines. Bookmark the permalink. BEAUTIFUL! that could be the prettiest ring I have ever seen!